As a mum to two girls whose body clocks are set to early starts it’s rare that I enjoy the romance of being up at dawn. However waking to mirror-like views and golden sun rises across the lake at Croft Farm Water Park near Tewkesbury was a special experience. We stayed in a glamping pod overlooking the lake for three nights. 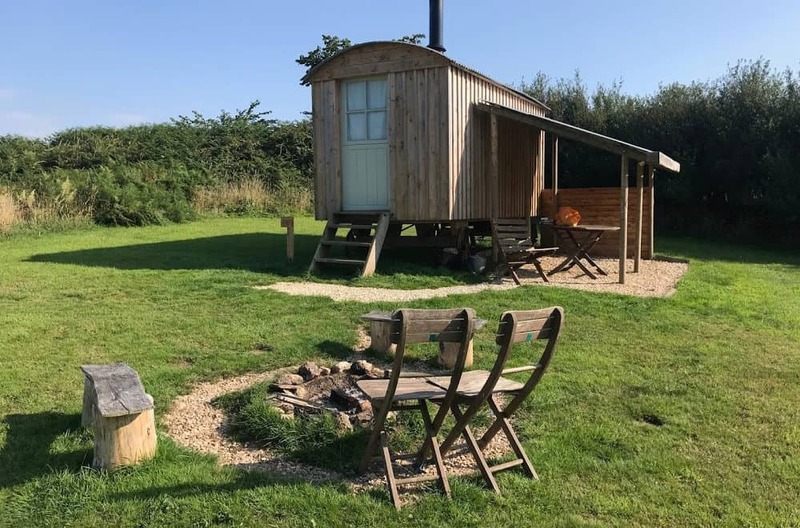 If you are looking for glamping in Gloucester, read on for our Croft Farm Water Park pod review. Croft Farm Water Park was our mid-way stop during a 700 mile UK road trip that had already taken us to Hebden Bridge in West Yorkshire, with our next destination being Salisbury in Wiltshire. I booked a mid-week stay for myself and the girls in a glamping pod, and a hardstanding motorhome pitch for my parents a short walk away. Both pitches overlooked the lake and water sports centre, which must be a hive of activity in the summer months. During our stay in October half term it felt like the site was settling down to hibernate, with no activities happening on the lake or round at the club house. This was just fine with us as it meant we didn’t feel guilty about exploring off site. Gloucestershire and neighbouring Worcestershire are areas that we’ve not previously stopped in during our UK family travels. When I booked, the site team had asked about our ETA and I’d been able to give them a rough idea of what this might be several weeks in advance. On the day of our arrival I had another call just to confirm and make sure that someone would available at reception. The lovely receptionist, Michelle, welcomed us and said she’d prepared our pod with the bedding I’d requested for the girls and I. The last place we’d stayed during out half term road trip had been a cottage in Hebden Bridge, so I’d decided not to pack bedding we’d only use once during the whole week. Michelle pointed out our pod and gave us a map of the site with all the facilities marked on it. We also got a key fob to open a barrier to access the camping and caravan pitches on the other side of the lake (remember to bring a £10 cash deposit for this). Next to reception there was a club house with bar and cafe, a gym and beauty salon. If you want luxury lodge accommodation, this is also on the reception side of the lake. Our four berth lakeside glamping pod was located just meters from the lake, overlooking the water sports facilities. In October, not much was happening but the girls could see the swan boats and were desperate for a go. Directly behind the pair of lakeside pods was a small playground and toilet block. Sadly the toilet was closed for the off season when we visited during October half term. The next closest toilet block was a two minute walk away. 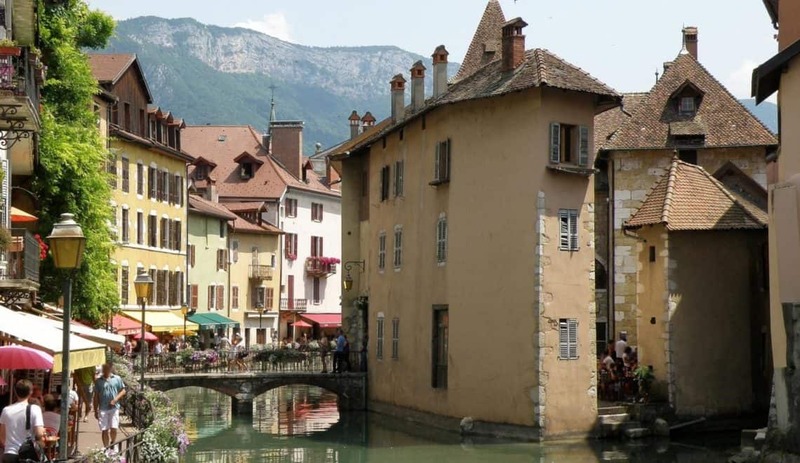 It was fine during the day but a bit of a trek in the cold at night with two children aged under six at the time. I should have remembered a potty! Our £80 a night lakeside glamping pod came equipped with a comfortable double bed and day bed, with a second single bed that rolled out from underneath. This got in the way of the pod door, which was a little awkward when one of the girls needed to get up in the night. However, when glamping or camping, there’s got to be some compromises on space. Other furnishings included two bedside tables and lamps, a dressing table, a small fridge, small coffee table, a bin, electric fan and oil heater. There was electric lighting inside and in the porch, which also had two plastic garden seats. The accommodation was very well presented and clean, but you still needed to come prepared with camping essentials like crockery, utensil and a means of cooking. Plus a couple of extra camping chairs if there are four of you. Take a look at my packing list for glamping holidays for ideas on extra things you might want to bring with you. Croft Farm Water Park also has standard glamping pods, which come with two sets of bunk beds to allow them to sleep up to four people. These cost £50 a night in 2018. Check the site’s website for the most up to date prices. The heated shower block was ‘no thrills’ but clean. In the ladies there were two good sized shower cubicles with fast running hot water, a few sink cubicles and a few toilets. There was also a free hair dryer. To the side of the main block there were some other shower cubicles in a wood clad portacabin. Around the back of the toilet block there were washing up sinks and bins for waste and recycling. Water taps were dotted around the camping, caravan and glamping areas. The clubhouse, bar and cafe weren’t open during our mid-week stay in October. These are open every day during the May half term and Summer school holidays and from Friday to Sunday, May 1 to October 31. We made the most of our National Trust membership and visited Croome which was about 20 minutes down the road from Croft Farm Water Park. It’s one of those places that we could easily return to with an RAF museum, huge grounds and woodland trails. While in Gloucestershire it would have be criminal not to meet up with our friends, the Travel Loving Family. They recommended a Halloween day out at Cattle Country Adventure Park, which was a great suggestion. This was about a 40 minute drive for us from the campsite. Tewkesbury was just down the road. My parents spent a day wandering there and seeing the Cathedral. We really liked our lakeside pod, which had a great view of the sunrise in the morning and kept us toasty warm even in October with the help of the heater. The park was obviously winding down for the season. It was a bit of a shame that the pod village toilet block was closed, as the night time trips to the other toilet block were chilly! But as we were the only people close enough to use the pod block I can kind of understand that it wasn’t cost effective to open it. It’s something to check if you are booking outside the main holiday season, especially if you have young children who have got to go when they’ve got to go! Overall we really enjoyed our stay, and exploring the Gloucestershire and Worcestershire area. I’d love to return in the summer and get the full benefit of the activities available on the lake at Croft Farm too. Oh, and if I was flying solo again I’d definitely bring my mum and dad again, so I could sneak off and have a shower on my own! Find out more and book glamping pods at Croft Farm Water Park on it’s website. Disclosure: We paid for our own stay. Three nights cost £270 plus £5 per person for bedding. 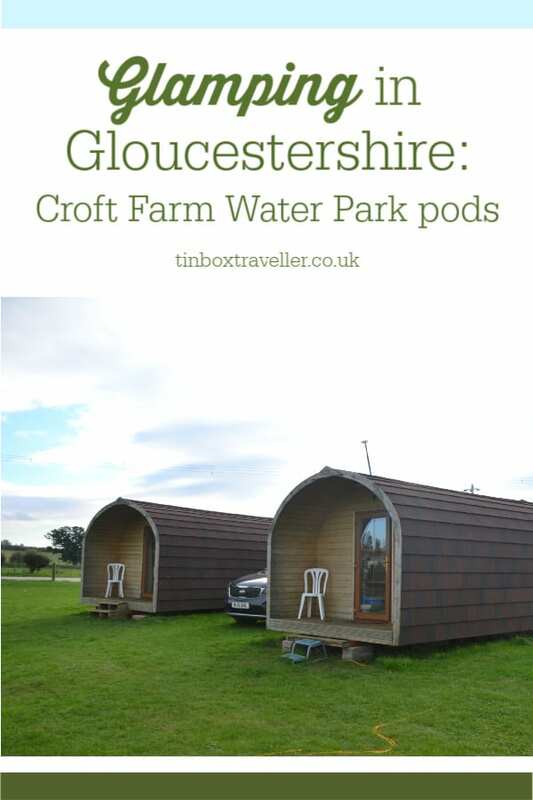 Pin this post about glamping in Gloucester and Croft Farm Water Park’s pods for later.